Vizio has announced a new series of 4K UHD TVs that leverage the advanced technologies developed for the company’s Reference Series, such as HDR (High Dynamic Range) and more accurate color, but at significantly lower price points. The 50-inch P-Series TV retails for $999, including a 6-inch Android tablet that can be used both as a remote and for streaming content to the TVs via the newly supported Google Cast. Said tablet is bundled with all P-Series TVs. This 6-inch Android tablet/remote will be included with each of Vizio's P-Series TVs. Vizio is calling its implementation of Google Cast (nee Chromecast) Wi-Fi multimedia streaming SmartCast, and it will be supported by all of its P-series TVs as well as upcoming sound bars and standalone Wi-Fi speakers. The company will also provide apps for both Android and iOS. In a recent demo I attended, 2160p UHD video and high-def audio were streamed successfully across a local SmartCast network, though you’ll need a large broadband pipe to stream 2160p from the Web. You'd never guess it from the Vizio-provided image below, but the new P-series TVs employ Dolby Vision and far exceed the HDR standards set for UHD. I watched the early battle sequence from “Man of Steel” where HDR was used to great effect. Of course, this requires HDR content, but it did look nice. Vizio claims there’s no increase in power consumption. 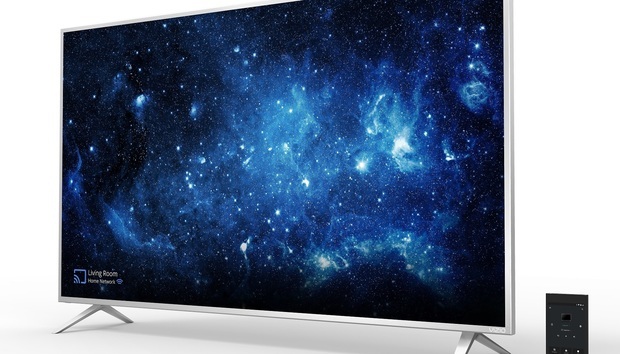 Sadly, none of the images (especially this one) that Vizio show off the Dolby Vision HDR used in the P-Series TVs. The P-Series color acuity was also quite good, though Vizio talked about tuned phosphors and filters rather than the quantum dots that were used in the company’s Reference Series. The P-Series TVs also feature a 128-zone LED array, down from the 384 zones in the Reference series, but four times the 32 zones found in the company’s M-Series TVs. This makes for good blacks, and I noticed no zone artifacts, such as blocking, in the content I was shown. To make a long story short, the P-Series TVs offer a darn good picture for the price. I also got to listen to the new SmartCast audio equipment and I was impressed by the sonority. All seemed well-tuned and the uncompressed Wi-Fi streaming suffered no artifacts as all. We’ll be back with a review as soon as Vizio provides us with a test unit.